What do Leonardo da Vinci, Aldous Huxley and Stephen Hawking have in common? They weren’t market researchers, that is for sure. However they were all futurologists of a kind. Leonardo da Vinci amongst his many inventive ideas predicted future flight including the helicopter. Aldous Huxley in Brave New World gave us ideas on social change. Stephen Hawking has recently got us thinking about artificial intelligence and threats and opportunities that come from robots. As market researchers, one of our responsibilities is new product development. But, how far into the future should we look when we are assessing opportunities for our clients? Indeed, how far into the future can we look? Being practical about it, most businesses have a relatively short horizon when they are thinking of new product development. Not unreasonably, they want quick results. Many are looking for results in 12 months or less. This presents us with problems. The take-up of new products, except in a few exceptional cases, is relatively slow. Of course, it depends what we mean by “new products”. In the case of something that has had a modest tweak, the response could be very rapid. The product already has wide acceptance and the tweak will hopefully make it better still. With products that are new inventions, the timelines are completely different. Many products and industries have regulations that require new products to be tested and approved. Also, the adoption of new products takes time. We have learned from Everett Rogers (he of the Diffusion of Innovations fame) that the population breaks into those who are innovators at one end of the spectrum and laggards at the other. It takes time and money to persuade the early majority and the late majority to move en masse. As a result, it can be years not months from invention to commercialization for a new product. 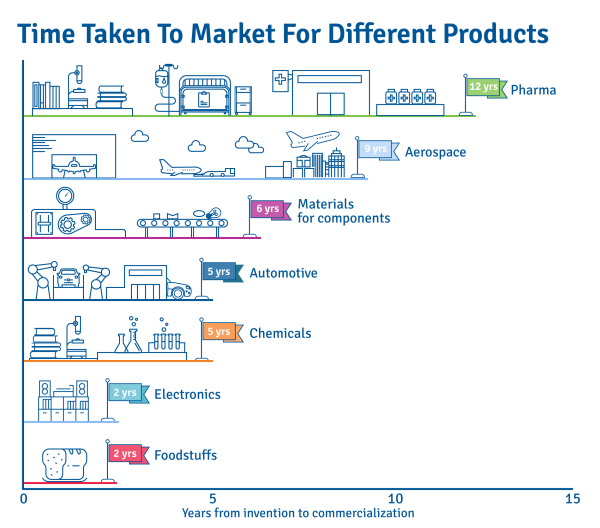 The chart below shows that many industrial products such as chemicals and materials used in manufacturing take between five and seven years from invention to commercialization. Sometimes it takes longer, depending on how much benefit the new material or product offers over existing ones. Look for the “so-whats” – because your new products must deliver benefits to someone, hopefully the customer. We should remember that for 150 years, we have struggled with the Qwerty keyboard, invented in the 1860s. It is clunky and confusing, but however hard inventors have tried, it has stayed firmly entrenched because the cost of change just doesn’t seem to be worth it.